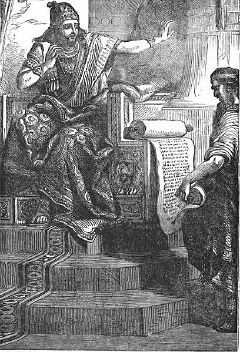 Josiah (יֹאשִׁיָּהוּ, Yošiyyáhuv, "supported of the Lord") was an important king of Judah whom the Bible praises as the greatest king since David. He was the son of King Amon, and the grandson of King Manasseh. Josiah instituted a major religious reform that centralized the worship of the Hebrew God Yahweh in Jerusalem and strongly repressed pagan religions. He also attempted to extend his control beyond Judah in a drive to reunify the former northern Kingdom of Israel with his own. Josiah died as a result of a wound suffered in battle against Egyptian forces at Megiddo, at the age of 39. The dates of Josiah's reign are roughly 640-609 B.C.E. Three of his sons and one of his grandsons reigned after him. His son Zedekiah, having reigned after Josiah's grandson Jehoiachin, was the last king of royal line of David. The chief sources of Josiah's life are 2 Kings 22-23, and 2 Chronicles 34-35. Archaeologists have recovered a number of "scroll-style" stamps dating to his reign. Josiah is credited by some historians with having played a key role in establishing the tradition of Jewish scripture. The story is taken up again in 2 Kings 22 when Josiah became ruler of Judah at the age of eight. His reign resulted from the assassination of his father, Amon, by court officials and the "people of the land." Both international affairs and Judah's internal situation at the time were in flux. To the east, the Assyrian Empire was in the beginning stages of its eventual disintegration, the Babylonian Empire had not yet risen to replace it, and Egypt to the southwest was still recovering from Assyrian dominance. This favored the resurgence of Jerusalem as a serious power in the region. The nation of Judah was finally recovering from a devastating Assyrian invasion in the previous century that resulted in the capture of every Judean town except the capital. Josiah's grandfather Manasseh had reversed the Yahweh-only religious policy of his own father Hezekiah, and Josiah's father Amon continued in Manasseh's footsteps. The boy-king Josiah was strongly influenced by the priests of Yahweh who raised and protected him. By the age 16, he had already become a strong devotee of Yahweh. At 20 he had instituted a program to "to purge Judah and Jerusalem of high places, Asherah poles, carved idols and cast images" (2 Chron. 34:3). At the age of 26, Josiah began a program to upgrade the Temple of Jerusalem, authorizing the high priest Hilkiah to take the tax monies that had been collected over the years and use them to repair the neglect that the Temple had suffered during the reigns of Amon and Manasseh. Hilkiah claimed that while he was clearing the treasure room of the Temple (2 Chron. 34:14), he found a scroll described as "the book of the Law" (2 Kings 22:8) or as "the book of the Law (Torah) of Yahweh by the hand of Moses" (2 Chron. 34:14). Many scholars believe this was either a copy of the Book of Deuteronomy, or a text that became Deuteronomy as we have it (see "Critical Views" below). Hilkiah had this scroll brought to Josiah's attention. The king checked its authenticity with the prophetess Huldah, who declared it legitimate and predicted (falsely as it turned out) that Josiah would soon die in peace (2 Kings 22:14-20). Archaeologists such as William Dever and others confirm the probable destruction of both pagan and Yahwistic official altars outside of Jerusalem during this period, but also report continued widespread pagan practices at household and village levels (Dever, 2006). Josiah also reasserted Judean control in the former territories of the Kingdom of Israel. This is recorded in 2 Kings as systematically destroying the cultic objects in various cities, as well as executing the priests of the pagan gods. This campaign included the destruction of the major Israelite altar at Bethel. This attempt at re-unifying Israel and Judah was made possible largely due to the waning of Assyrian power in the region while the new Babylonian Empire asserted itself to the east. Pharaoh Necho II had left Egypt around 609 B.C.E. in support of his Assyrian allies. Josiah made a fateful decision to attack the Egyptians at Megiddo, where he was reportedly struck by Egyptian archers and soon died in Jerusalem (the account in Kings 23, however, differs from that of Chronicles 35 in terms of the manner and timing of Josiah's demise, perhaps reflecting the Chronicler's desire to harmonize his account with Huldah's prophecy that Josiah would die in peace, even if wounded mortally in battle). Our pursuers were swifter than eagles in the sky. They chased us over the mountains and lay in wait for us in the desert. The Lord's anointed, our very life breath, was caught in their traps. We thought that under his shadow, we would live among the nations (4:19-20). From a geo-political viewpoint, Josiah's death signaled an end to the pro-Babylonian foreign policy he apparently favored. Jehoahaz, the second son of Josiah, reigned for three months, after which he was dethroned by Necho and exiled to Egypt. Josiah's eldest son, Eliakim, replaced him, ruling at Necho's pleasure as Jehoiakim. When Nebuchadrezzar II of Babylon defeated Egypt at Carchemish in 604, Jehoiakim and his kingdom became subjects of Babylon. The prophet Jeremiah counseled submission to Babylon, but in 598 B.C.E. Jehoiakim rebelled. He died soon thereafter with Jerusalem under siege. His son Jehoiachin held out for three months and then surrendered. He and his entire court were deported to Babylon. Nebuchadrezzar now placed on the throne Josiah's third son, Zedekiah. Jeremiah, still in Jerusalem, again urged cooperation with the Babylonian power, which he saw as God's chastising agent for Judah's sins; but other prophets urged boldness against the foreign enemy (Jer. 28-29). Destroying Jerusalem in 586 B.C.E., the Babylonians blinded Zedekiah and brought him captive into exile with a large number of his subjects. Thus ended the Josiah's royal line, the "house of David," and the Kingdom of Judah. Josiah plays a pivotal role in the modern critical interpretation of biblical history. The key incident in this appraisal is the "finding" of the "Book of the Law" in the Temple, which precipitated Josiah's brutal repression of non-Yahwist religion. Other biblical books portray authentic priests and prophets of Yahweh—including such notable figures as Samuel and Elijah—as offering such sacrifices at various altars and "high places." Proponents of this theory also point to linguistic evidence and to the many anachronisms contained in the Book of Deuteronomy which suggest that the scroll was likely to have been written during the reign of Josiah. Some scholars go on to propose that the basic narrative from Exodus through Kings constitutes a "Deuteronomic History" created primarily during Josiah's reign. This narrative used earlier sources such a "J," "E," and the records of court historians. However its compilers edited them to present the view that God rewarded those kings who supported the Yahweh-only policy in religious affairs, while punishing both Israel and Judah when they failed to repress pagan worship. King Josiah was thus the ideal ruler as the Deuteronomists defined it. 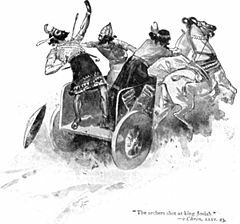 Moreover, even the stories of Joshua and Moses—though already in existence—were developed in such a way as to promote Josiah as a new leader of the Chosen People who would drive out Canaanite practices as a new Joshua, unify the land that had been divided because of idolatry, and boldly prevail against the Egyptian pharaoh as Moses did. However, scholars such as Rudolf Kittel disagree, pointing out that priestly forgery of the Deuteronomic text was unlikely. For one thing, the text placed restrictions on the privileges of the priestly class, who were actually a thorn in the side of Josiah. Moreover, in the ancient Near East it was commonplace for religious scrolls to be deposited in temple walls when they were constructed (Hertz 1960), and a similar find is recounted in the Egyptian Book of the Dead. ↑ Israel Finkelstein, The Bible Unearthed: Archaeology's New Vision of Ancient Israel and the Origin of Its Sacred Texts (New York: Free Press, 2002, ISBN 0684869136). This page was last modified on 30 November 2018, at 20:18.